The bear market in precious metals equities will end soon, says Jordan Roy-Byrne, editor and publisher of The Daily Gold Premium, perhaps even by the end of the year. But the rising tide will not lift all juniors equally. In this interview with The Gold Report, Roy-Byrne explains why bottom-fishing is a bad idea and why the savvy investor must find companies that will not just survive but thrive when the bears become bulls. The Gold Report: The managing director of the International Monetary Fund, Christine Lagarde, worries about the world sliding back into recession. What are the chances of that? Jordan Roy-Byrne: We tend to have recessions every four or five years, on average. In the last 30 or 40 years, however, recessions have been less frequent than the average, due to extremely expansionary monetary policy. But another recession is almost a certainty in the next couple of years. I expect it will be milder than the 2008 recession. Typically, after such a severe recession or financial crisis the next recession is quite mild in comparison. TGR: We seem to have permanent quantitative easing in the U.S. Do you think there's a point when the country will hit a debt wall? JRB: I don't know if the U.S. will ever hit a debt wall. We have the world's reserve currency, and that's not going to change any time soon. We have the ability to print a lot of money, and there's always going to be demand for our bonds. If that demand wanes, I think we will see central banks increase their buying. They will buy every bond if they have to in order to prevent interest rates from rising. Looking out over the next five years, I see similarities to the 1940s after World War II when there was essentially huge quantitative easing and interest rate price fixing. This was done to lower the debt-to-GDP ratio. There were a couple of recessions, but when the economy grew, it grew very strongly. There was quite a bit of inflation, that was the negative consequence, but the debt-to-GDP ratio did begin to decline. The problem with debt is not the nominal amount. The problem is when the economy doesn't grow fast enough to service the debt. One way to deal with that problem is to keep interest rates extremely low so there is very high nominal growth. The drawback to this is inflation. Commodity prices in the mid-to-late 1940s escalated substantially. I think we could see similarities in the next five years. TGR: We've seen for some time an inverse relationship between precious metal stocks and equities in general. Do you think this will continue? 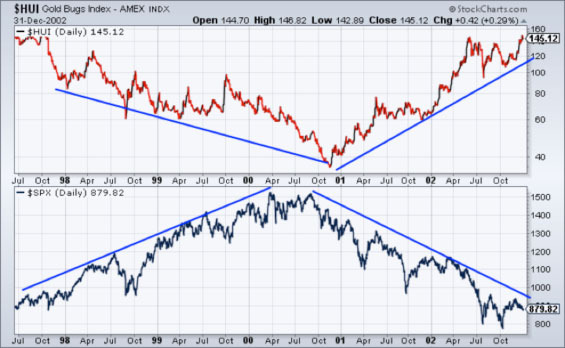 Must equities fall before gold and silver stocks rise? JRB: I do think this relationship will continue. Historically, gold stocks have performed fantastically at times when equities are in a bear market. The two best examples are 1972–1974 and 2000–2003. Because the gold bugs have lost a lot of money and don't have the firepower to drive the market higher right now, outside money is going to have to come in. I think once conventional investments weaken, which I expect to happen in the next three to six months, asset managers will look to precious metals. For example, there were quite a few generalists and international fund managers at the recent Denver Gold Forum. TGR: How long will this bear market in precious metal stocks last? JRB: It could already be over. Gold and gold stocks have been in a bear market for two years and two months but silver, silver stocks and juniors peaked in April 2011 and have been in a bear market for 2.5 years. History shows that bear markets in the gold stocks tend to average 65%, while the two worst were 72%. At the June low the NYSE Arca Gold BUGS Index (HUI) was down 67%. That tells us the market is likely very close to a low or has already bottomed. The market is retesting its summer low. Some stocks have already bottomed. Some will make double bottoms, and the worst will make new lows. That's just how a bottom is—disjointed. The major bottoms in 2000 and 2008 occurred in October–November, so we are right on schedule.